Do you remember MacGyver? The popular 80s TV show that featured a young action hero who could perform almost anything with the help of almost nothing. He once fixed an aeroplane with a chewing gum wrapper (Beats me!). Well, if you think you can do similar stuff with puny things then we’ve got the perfect gift for you. 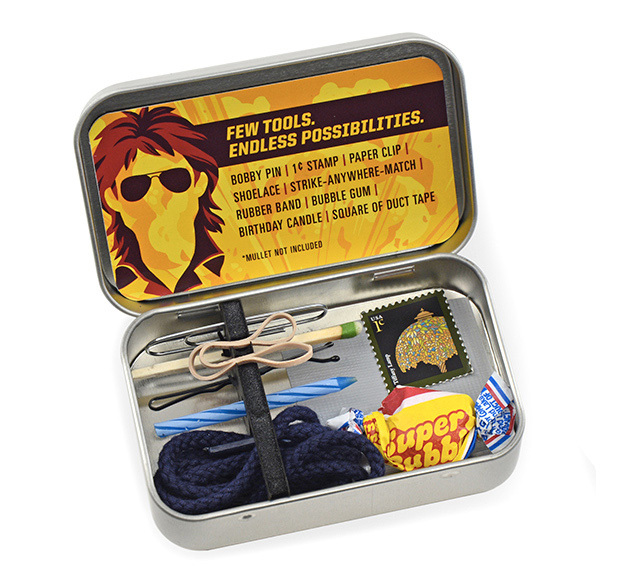 The toolkit consists of a bobby pin, one strike-anywhere match, single rubber band, bubblegum with wrapper, birthday candle, one paper clip, shoelace, one-cent letter stamp, and a square of duct tape. Yes, it sounds like junk but this is what 80s popular action heroes used to save the world. If you want to save the world, you need this. The Action Hero Toolkit is available for $9.95 via iFixit.